This morning I want to share a Best Friend card I created using the Sketch for the new challenge over at Paper Play Sketches. I will be sending this card to Claire from over at Scrap My Way to thank her for the beautiful bracelets and card she sent me for my birthday which is tomorrow. Your card is soooo adorable!! This is absolutely adorable! Love the fun background!! Super cute card, Nana! Happy Birthday to you! Oh gosh - How Adorably SWEET! She will love your card! And HAPPY HAPPY BIRTHDAY!!! :) Thanks for linking up your project using our sketch at Paper Play Sketches. Link up as often as you’d like! This is so pretty. I love the watercolor look background. Thanks for linking up your project at Paper Play Sketches. Thanks for linking up your project using our sketch at Paper Play Sketches. This is so sweet Nana! Thanks for linking up your project using our sketch at Paper Play Sketches. Our challenges are every other Wed. Link up as often as you’d like! What sweet little bunnies! 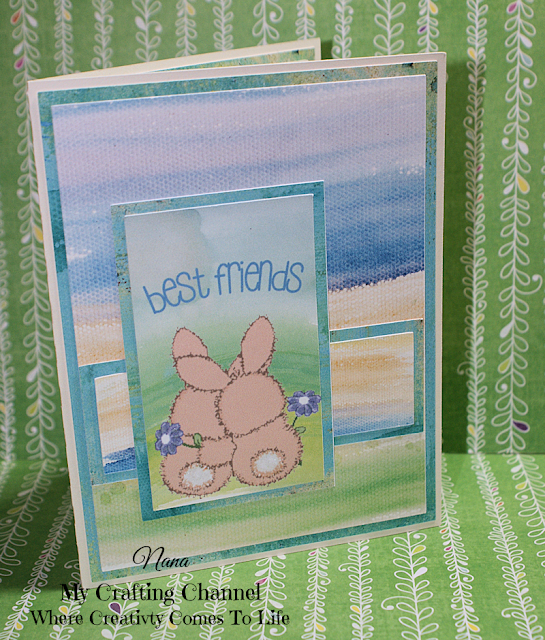 I love the pretty background paper you used -so soft and springy! I hope you have a wonderful birthday sweet lady! I sure do like the bunnies from the backside with their white fluffy tails. Cute image! Thank you for joining our Sketch Challenge this week at Paper Play Sketches.